SECOND POST – MERCURY CULTURAL INSTITUTE REVIEW OF “GRACIE SEE’S PIZZERIA”, VOTED THIRD BEST RESTAURANT IN MICHIGAN. Cedric Sniffelton, Chief Food Critic for MNS reporting from Warrendale, Detroit. According to owner, Gracie Puleo, her father named it Gracie See to give it a certain recognizability. There was no other reason and the name has no special meaning. Located on Greenfield Road just south of Warren Avenue in the Warrendale Corridor of Detroit, just on the border with Dearborn, this venerable and world-renowned pizzeria, boasts the best “gravy” west of Brooklyn, New York. The “gravy”, for those readers who are less than “hip”, is the word real Italian-Americans use for “spaghetti sauce”. Here it is generously ladled on with a homey style reminiscent of those charming scenes from the Godfather Trilogy – plump assassins bantering with Michael as they dump a bowl of sausages into a huge pot of bubbling marinara. evidencing a hoarding syndrome, not altogether disagreeable. The parking lot is large but should be approached warily as you negotiate the strategically placed potholes to find a parking space with just one clear yellow line. But it really makes no difference. Gracie’s belongs to that way of thinking which eschews constraints on a customer’s freedom. You want to park athwart the front door? Why not. Would you like to park perpendicular to the U-Haul truck standing at the driveway? Yes, you can. While it is in Detroit, some people might worry about a medical emergency and the notoriously lapse-laden Detroit EMS (forget the police unless you are dead). But, fret not. Gracie’s is right across the border from Dearborn which has a much better reputation for emergency response. Any conscientious customer can drag you across Greenfield Road to an healthier result. The museum-like interior of Gracie’s suggests a fixed basement from the Fifties or a hunting lodge. You can find most every non-vulgar poster ever printed in the U.S. on its walls. The interior is charming. That is if you don’t mind being in a labyrinth. No Minotaurs here though. But as you walk around in search of the rest rooms, you will, at times, sense that you have walked into the “Inner Sanctum” with the sibilating voice of Jack Palance taunting you. The interior lay-out was obviously the product of autism (mild variety), endlessly empty party rooms appearing as you struggle to keep from wetting yourself. Some rooms you traipse into while mesmerized by your own helplessness seem tailor-made to quietly absorb you into their walls. One room, I can happily report, has a bar which we assume can be hired for private parties – that is, if it can be found reliably again. And whether is really exists is another issue. Such is the mystery of this establishment. But who cares if the atmosphere is retrogressive – if the food is excellent and the service is ministered to by a bevy of very friendly and chatty waitresses? The table arrangement is quite unremarkable but for the aforementioned praeternatural design of the premises. You have a small bar with an adequate assortment of liquors, a cooler containing bottled/canned beers of every kind and a quadrupled spigot rack for draft beers. On Wednesdays, draft beers are only $1.00 for a pint. On Thursday, you can have bottled beers, even the imported ones from Canada, for only $1.50! A real rummy’s delight! Gracie’s pizza is arguably the best in Michigan. This critic has not had any pizza in this state which can rival the pungent and sweet sauce Gracie’s uses under a layer of very fine quality mozzarella. The toppings are just fine with a crust that is appropriately crunchy without being burned. At Gracie’s, the pizza chef will julienne all your toppings in order to have a more even spread. There is nothing more insidious than the guest who tries to take the pieces with the most pepperoni! This technique of mincing up the toppings indicates decades of honing the craft of pizza-baking. I also must warn my readers that Gracie’s pizza comes out very hot which means you must take care not to showcase your ravenousness lest you find yourself with a 1st degree burn on tongue and palate. But Gracie’s has more than pizza and beer pitchers. There is a full menu of ordinary American and Italian fare, all made with an eye to presenting quality products. The Wednesday Pork Chop special must not be missed. You get two lean pork chops, green beans or corn and a small bowl of apple sauce (no cinnamon). But the best part is the entire package: order a cup of Minestrone soup (good) with the Parmesan shaker, a small salad (iceberg, wedge of tomato), a small plate of Rotini with their signature gravy and you have the first three courses to be completed with the overly-generous pork chops. But I deliberately hid from you the first course. You thought that was the soup. No. It’s the basket of breadsticks, bread and packaged butter which I believe is a must for any restaurant of note. I always attack the breadsticks and butter. I naturally begrudge others any access to this one treat once it is placed before me. I am jealous of my breadsticks. Like Julia Child, I am repulsed by the doomsaying anti-saturated fat rabble whose very existence is an affront to the Muses of good taste. I curse them under my breath as I wolf down at least four pats of butter that crown my sesame-covered breadstick. I cannot recommend the Thursday ribeye steak special unless you have spent your life in the circus performing as a miracle rubber-chewing freak. But you can order the delicious Veal Parmesan with all the courses mentioned in the foregoing. The prices at Gracie’s are absolutely inviting. I also can recommend their fried shrimp. They give you a lot of quality shrimp even though the breading is a bit cloying. It is crunchy, however, which is a positive characteristic. They have a selection of wines, but nothing imported that I noted. If you can tolerate Carlo Rossi bulk Dago-red (no offense intended), you’ll be fine. If you are like this author, blessed with incomparable sensitivity to the oenological sciences, you might want to stick to beer. Their submarine sandwiches are fine and generously stuffed with quality meat. Observant jews and muslims might want to pass on this item. Observant jews and muslims may just want to go to bloody Hell! I want ham! I want hot Italian sausage! And don’t tell me about Kosher or Halal hotdogs, crumb! Gracie’s receives our highest rating and deserves its position as number three on our list of the best restaurants in Michigan. It’s a great place to go for pizza and beer. It’s menu is sufficiently complex to afford any customer an expansive choice for lunch or dinner. We do not recommend Gracie’s breakfast menu since it does not open until 11:00 a.m. People found at the location in the morning can be charged with loitering if only the Detroit police would drive by on occasion. Our poll of Michigan residents places Gracie at the very top. When compared to “the Lark” or “Roast”, Gracie outclassed those two “eateries” by a margin of 10-2. One participant in our poll, who lives right behind Gracie’s in the Warrendale quarter, assailed the Lark as “just another frog pigsty”. 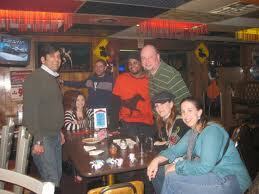 Rupric Entwhistle of Ecorse averred: “Yeah, I tried the Roast place. It’s run by some Greek. It’s pretty sad for it to be downtown. I like Gracie’s better.” And so on and so on. 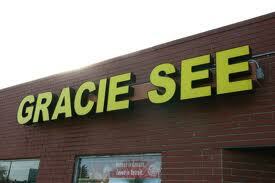 I’m going to Gracie’s right now for lunch. Ta ta. Based on this review, we gave Gracie a wirl. We loved it, especially Gracie and her ever friendy staff, a remarkable family, and super pork chop burger.